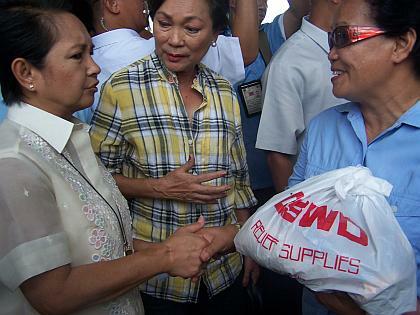 Iloilo City (2 July) -- Some 30,000 relief packs were distributed to the typhoon-affected residents by President Gloria Macapagal Arroyo in a ceremony held July 1 at the Iloilo Airport. The Malacanang press report disclosed that the relief goods amounting to P10 million was donated by the Philippine Gaming Corporation (PAGCOR). Each relief pack contained four kilos of rice, 12 noodle packs and six sardines. The distribution of PAGCOR relief packs, including blankets, medicines and cooking utensils were held simultaneously in 10 Iloilo towns through the Philippine Medical Association, Malacanang said. The PAGCOR assistance was coursed through Mayor Arcadio Gorriceta of Pavia; Mayor Isabelo Maquino of Sta. Barbara; Mayor Vincent Flores of Oton; Mayor Vic Tabaquirao of Tubungan; Mayor Cristin Garin of Guimbal; Mayor Ronaldo Golez of Dumangas; Mayor Rigor Brazas of Zarraga; Mayor Rey Grabato of Mina; and Mayor Ben Margarito of Janiuay. The President was in Iloilo to discuss massive relief operations for Western Visayas. Also on hand for the President's arrival were officers of the Federation of Filipino Chinese Chambers of Commerce which turned over a check for P10 million for the typhoon victims.